by Paula Melton and Robert G. Andrews Jr. 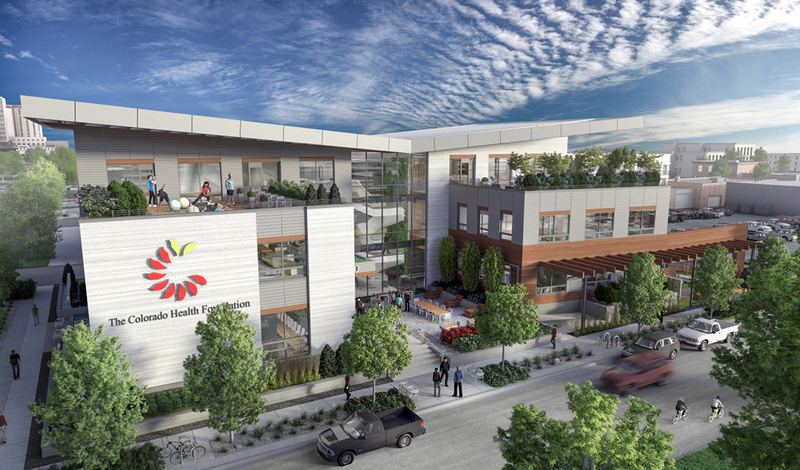 The headquarters of the Colorado Health Foundation, designed by Davis Partnership Architects, is a LEED v4 project focusing on workplace health and wellness through active design, healthy food choices, and biophilia. With slightly more than 400 building design and construction (BD+C) projects registered after two years, LEED v4 appears to be suffering from a case of risk aversion. First there are uncertainties about costs. Then there’s reluctance to raise the bar on sustainability in exchange for a lower LEED rating. Not to mention the horror stories about hours spent on product research, followed by rejection of documentation. Since LEED v4 isn’t required yet (the U.S. Green Building Council has extended an already-long phase-out period for LEED 2009), why risk it? Although most building professionals we talked to have expressed that exact sentiment, some teams are already out there achieving v4 credits with slight cost premiums—and with none at all for most credits. We’ll detail some of these below, along with a dollar-for-dollar case study of one LEED 2009 project if it had been built under v4 (see sidebars). But there’s also less-rosy news: even familiar credits are harder to achieve now, and it’s unwise to make assumptions about your scorecard at the outset. We’ll share caveats, solutions, and workarounds for some of these issues as well. Perhaps you already know you’re not going to pursue v4 projects or credits until you have to. This article’s lessons from early adopters will prepare you for the inevitable day when it will be necessary. The case study excerpted in this article first appeared in our special report The Cost of LEED v4. Here we’ve expanded on our quantitative research on v4 to provide analysis and lessons learned from the field.